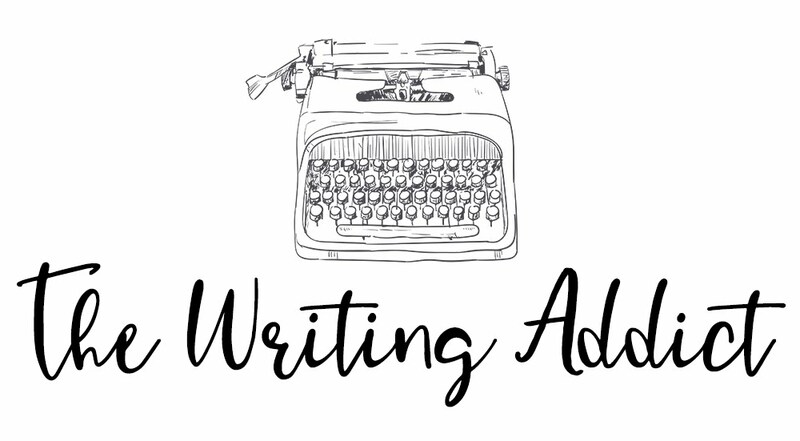 A braided essay is a popular structure for creative nonfiction essays. 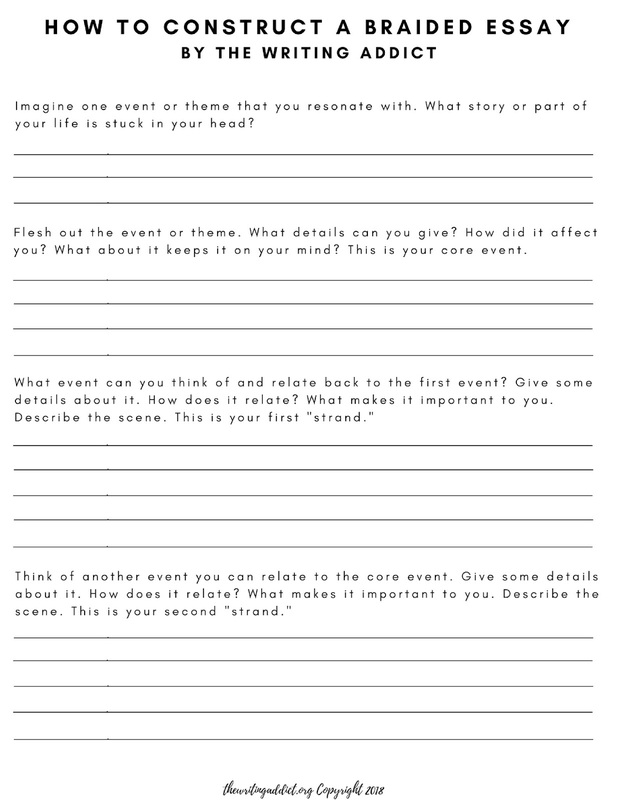 Braided essays generally use 2-3 moments or topics and create an essay surrounding an event or question. While collage style essays are a personal favorite of mine, I love a good braided essay too like many readers. This may explain why braided essays are used by many authors to entertain readers including Joann Beard, Chelsea Biondolillo, and Anna Redsand to name a few. 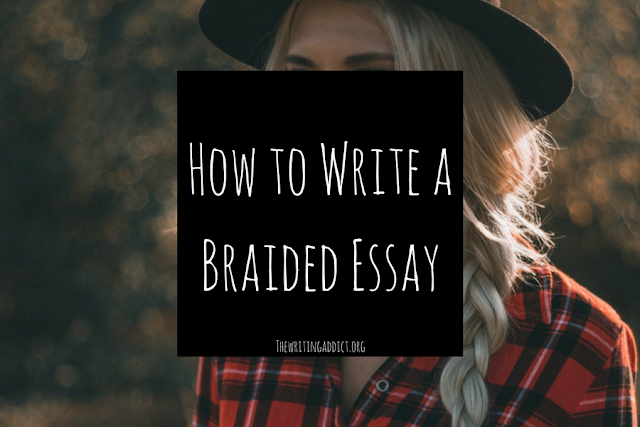 But what is a braided essay and how do I incorporate it in my own writing? Don’t worry reader/writer, I’m here to lay it all out for you, so you can be on your way writing braided essays in no time. What is a Braided Essay? Beard’s main strand is her narrative about taking care of her sick collie that is dying. Her first strand is dealing with the squirrels in her spare bedroom and the breakdown of her marriage. The final strand is the Iowa University Physics department shooting. All of these events are weaved together to create one essay about an author’s inability to control the events happening in her life. Braided essays can have more or less than three “strands.” Essays have been known to have just two strands or four to five. 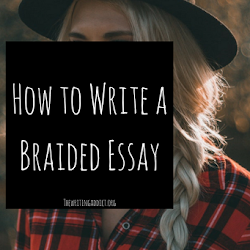 The most important thing to note about braided essays is repetition of the braid “strands.” The repetition of these elements are what makes an essay braided rather than just a collage. If you place multiple fragmented events and don’t repeat them, you are making a collage, not a braided essay. Now that we have a clear definition of what a braided essay is, let’s outline one. I created a PDF to help you outline your essay. You can gain access to this free worksheet and others by visiting my Resource Library. The worksheet is pretty straightforward and basic. It by no means encompasses what your braided essay can be, but I thought it would be easier to go over a simple braid. First you will chose the anchor of your essay, otherwise known as the main strand or core event. This can also be a theme if you’re exploring different facets of something. In Beard, her main core event is taking care of her collie. (You can also say it’s the shooting, I believe it’s open to interpretation, but either way this method works no matter what you choose as the core). 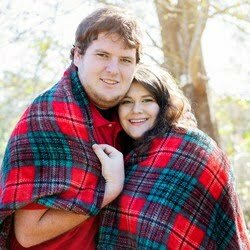 With this core event, Beard weaves two other strands. The first other strand is the Beard’s failing marriage and the squirrels investing her guest bedroom. This event ties in the collie because it is another thing Beard doesn’t have control over and can’t deal with on her own. You will need to chose another event that makes sense when related with your core event. It is good idea to pick a longer scene or topic in order to continue the repetition pattern that has to happen. After choosing two events, you will need to pick one more to round out your essay and complete the braid. It doesn’t have to exactly relate to the first other strand you chose, but needs to relate to the core event somehow. In “The Fourth State of Matter,” Beard talks about the Iowa University Physics Department shooting. This relates to the collie because Beard discusses the collie with her coworkers, but also later because of Beard not being able to save her coworkers and their own death she has to deal with. Again, the key here is the repetition. Beard is constantly weaving these events in her essay to create the braid. 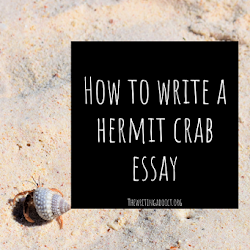 You must do this too to create a proper braided essay. If writing braided essays intrigues you, or you enjoy reading the format, I have a few sources of inspiration to share with you. Along with Beard’s “The Fourth State of Matter,” other braided essays include: Biondolillo’s “How to Skin a Bird” and Redsand’s “A Good Stranger.” Biondolilo’s “How to Skin a Bird” is a more fragmented version of a braided essay and discusses the author’s relatonship with her daughter while instructing on how to skin a bird properly. Redsand’s “A Good Stranger” discusses the author’s religious identity, braiding Christianity, Judaism, and Navajo tradition. “A Good Stranger” is a great example if you are looking to write on theme rather than focus on a certain event. You can also find more information and other works to read at this website. Wow. That was a lot of information to go through, but I hope you found this blog post insightful and inspirational. If you like the braided essay style, but want more freedom, collage essays may be more of your taste. Don’t worry, I plan on doing another post like this on collage essays soon. Do you have a favorite braided essay? 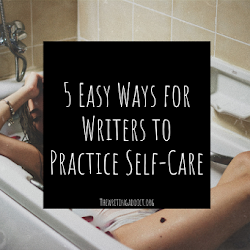 Have you written one? "How to Skin a Bird" is about the author's relationship with her father, not her daughter. But otherwise thank you for this. Beard's "Fourth State of Matter" is pretty unparalleled in my opinion, but I like the form and variety of braids I see in these essays and appreciate the thoughtful way you wrote this post.